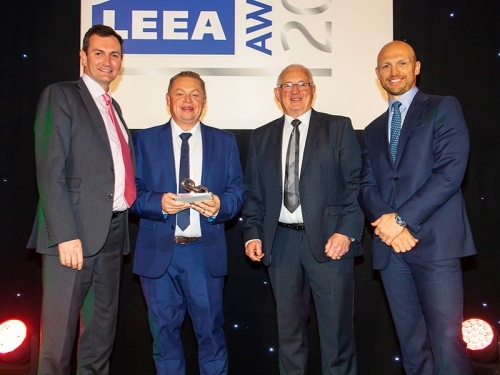 Load cell manufacturer Straightpoint (SP) won the inaugural Lifting Equipment Engineers Association (LEEA) Safety Award, presented in front of over 260 guests at a gala event staged on the first night of last week’s LiftEx trade show in Milton Keynes, UK. Sponsored by lifting and rigging equipment provider Rigging Services, it was one of eight trophies to be given out on the evening as LEEA, the leading authority in the industry, used its flagship event to make a definitive move to recognise member companies and individual representatives for their success against specific judging criteria. SP was also shortlisted in the Apprentice of the Year, Innovative Product of the Year, Sustainable Solution of the Year, and Unsung Hero categories. Customer Service, Manager of the Year, and the Kevin Holmes Award (a memorial accolade developed to reward companies, teams, and individuals who display excellence in people development) completed the list of honours. Doug Price, technical manager at Rigging Services, presented David Ayling, director at SP, with the hefty piece of silverware. Celebrity guest speaker Matt Dawson, a retired England rugby union player and now a familiar face on UK television, joined them on stage. The evening was also notable for raising over £2,000 for Great Ormond Street Hospital.